The C-56 was a motor-sailor based on the Columbia 57 hull. Columbia added a plug to the mold to create a different transom and then fitted a center cockpit motorsailor deck. The C-57's trim tab on the aft edge of the keel was made a solid part of the keel on the C-56. The sail plan was labeled a cutter rigged ketch although the mizzen mast was almost over the rudder post. 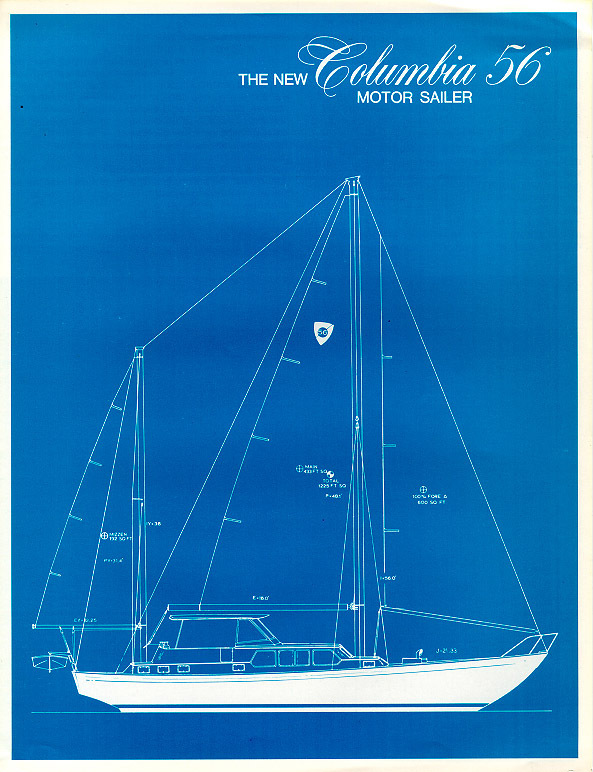 Columbia chose this configuration to ease sail handling in keeping with the motorsailor philosophy. The mainmast was cut down about 3 ft. from the C-57 and the staysail was club-footed making it self-tending. Columbia built each C-56 to order. There was a standard interior layout, but the all-plywood construction made it easy to modify the plan to satisfy each customer's requirements. The C-56 was reported to be a nice sailing craft - especially for a motor sailor. Columbia evidently made a good decision to base the model on the C-57, a nice sailor in its own right. These specs are from the C-57, so they might be off a little - especially the LOA. Columbia entered into an arrangement with Elie Schalit to produce the ColItalia 56. The project started as an offshoot of Columbia's Sailcrafter kit business. ColItalia imported the C-56 hull and deck to La Spezia, Italy and finished the boats there. The interior layout and design was done by Italian designer Carlo Bertolotti. The boat interiors were ultra modern and not traditional at all. Columbia sent 6 boats to Italy. What has become of them is not known. The oil crisis of '73-'74 and corporate changes at Columbia eventually killed the project. Here is hull #1 as it was about to be launched in Italy and another shot of it docked in Antibes, France. The Columbia 56's that were built in Costa Mesa were built with the standard plan that is on the drawings. I know of 1 that was built and one partially finished before they moved to Portsmouth. The boats were only going to be built to order and I doubt if Columbia pushed them much when they moved. I think there were about 6 or so more that were molded for Sailcrafter so the total was probably about 12 to 15. I do not know if any were ever finished. Someone told me about ten years ago they saw a 56 hull and deck out near Riverside, California that someone was working on. I have information from a separate source that a C-56 was in Acapulco in charter/day trip service as of 1995. I found your Columbia web site very interesting and would like to let you know that I am the owner (with my 2 brothers) of a C56 for abour 4 years now. I know that the previous (and primary owner) bought the boat in 1976/77. The boat was partially finished and interior & external arrangements were made by this first owner. 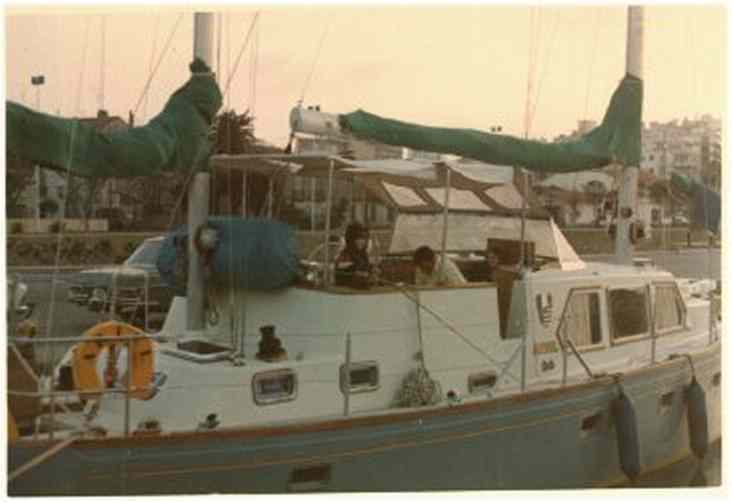 The boat then went to french Polynesia where he did charters during arround 10 years. When we bought the boat in 1999, it was lying in the lagoon of Raitaea (French Polynesia) and we had to work one year before the boat could sail again. The C56 (named Aita Pea Pea) is far from being completely re-newed but with time and work, I hope that one day it will OK...... 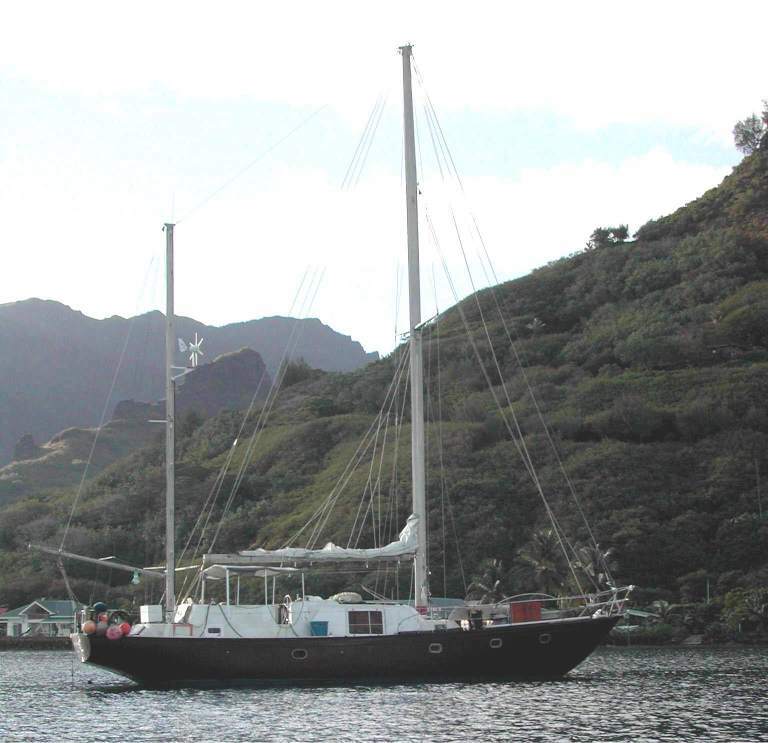 I have attached a recent picture of the boat in Morea Lagoon. Thanks again for your job on the web site.